hit it off really well, at least at first. I know people say that Angelina was younger and more beautiful and that is why Brad left Jen, but that is only half the story. 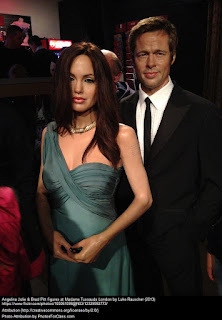 With Brad and Angelina there would be an instant attraction of personalities and after studying their hands one fully comprehend why the press called them Brangelina! Both of them are lovers of life, and both have things they would enjoy doing together. It’s easy to see why they were attracted to each other, and would have a great time being together. Sexual attraction always does play a part but that must have figured more with Brad's attraction to Jennifer Aniston. 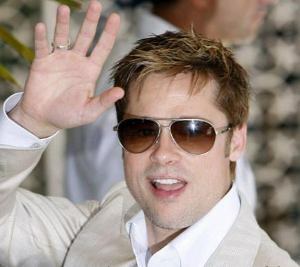 Check out a hand photo of Brad Pitt's here and Angelina Jolie's hand photo here. And you can see Jennifer Aniston's hand photo here. For reading their individual hand readings click on their names. Brad himself is the kind of person who likes adventure and likes to explore and experience different things and he would get a more willing companion in Angelina. Jennifer is the kind who would find a dozen reasons why one should not do a certain thing and would want things just so. Angelina would be more willing to take chances, and not complain if plans don't work out perfectly. She is more accepting of situations if they do not work out exactly as planned, although Angelina herself is a great planner! Brad is a practical sort and never does expect perfection. He can accept things as they are to a large extent. In fact, his problem is that he doesn't plan that much and here Angelina would be a big asset to him. She will plan and take life as it comes as well! When it comes to getting along I had mentioned that Brad is put off by too much overt aggression and pushiness (he is not like that himself) and here Angelina scores over Aniston as she is less overtly aggressive. However, Angelina is more controlling and possessive than Jennifer and is likely to dictate to Brad even in small things. I am not sure how he handled this because he is a controlling person to some extent. This would be a major source of conflict. There are other reasons why Brangelina’s relationship can become rocky. Angelina tends to go overboard at times, and can lose focus from the actual business of living. Brad is more balanced, more practical, and some of Angelina’s ideas he just would not like. She never just has ideas, she likes to follow them through and this is a source of conflict as well. However, it is possible that they may not clash too much on the issue of financial security as long as both are earning huge sums. The latest news is that Angelina is now the highest paid actress in Hollywood. As I am not aware of the exact situation in their respective careers (in terms how much income and expenditure they have or their potential earnings) it is difficult to say how much they clash on this issue. Angelina has her faults, but being more practical and less self-centered than Jennifer, she is likely to get along better with Brad. However one should keep in mind that Angelina's hands show that she can be very manipulative, and would do what it takes to try and get her way with Brad. She would like to do what she pleases but would not tolerate the same in Brad. And when it comes to persuading her, what Brad will always have to watch out for is her ego and her righteousness. Angelina overall has a broad outlook on life, very liberal, and Brad’s hand shows that his set ideas start to change as he gets into his forties, becoming more liberal and broadminded. It is possible that Angelina influences him. All in all, Brad is the more balanced personality of the two, calm and very solid and dependable. However, he is no pushover and would seethe with resentment if he finds himself being manipulated or controlled. However, as I had mentioned in Angelina’s reading, she is vulnerable at heart, and can put aside her ego if handled right. That's a big IF. When relationships go wrong it is not always because there are irreconcilable differences, but often because communication breaks down. One hopes that this doesn't happen in the case of Brangelina, because they have a decent amount of compatibility with each other. Unpleasantness, however, has its way of creating bitterness and resentment and hatred, and the couple needs to be careful. Particularly in a society where breaking up is no big deal. The best thing about Brangelina is that Angelina appreciates Brad for who he is, something that Jennifer didn't when they were together. You can also read about Why Brad Pitt and Jennifer Aniston did not get along. find out more about the Relationships of other famous people! I think this is more reliable.. I have heard that Astrology is some kind of maths... but din't got much info.. do you know about it??? from this, we can find what type of people suit us? kanagu, I do agree that one should do some sort of hand reading analysis before going in for a marriage and in fact I did not marry someone I met through an arranged match because his hand showed a short temper. The kind of person I am (I am very sensitive) I knew I would only be able to get along with a calm and reasonable minded person so I refused that boy who was good in all other respects! About Astrology it is based on the influence of planets on human beings and I don't believe that at all. Vishesh yes ofcourse you can!! I am sure even when it comes to your friends there are some traits that you simply cannot stand in people and god forbid that you marry one of a kind you detest! !